As you can tell, I have a thing for cakes. They are so much fun, so pretty, and I cant stop making them. Plus, they are little man’s favorite treat, and as he continues to work through his speech therapy, I can’t help but reward him for trying so hard to talk. And what doesn’t get someone motivated, if not CAKE? I’ve been switching it up a lot and testing out a lot of techniques- especially since we’ve gone gluten free- and wanted to share this fun and adorable birthday cake idea with you! I’m including a regular and gluten free recipe, too! 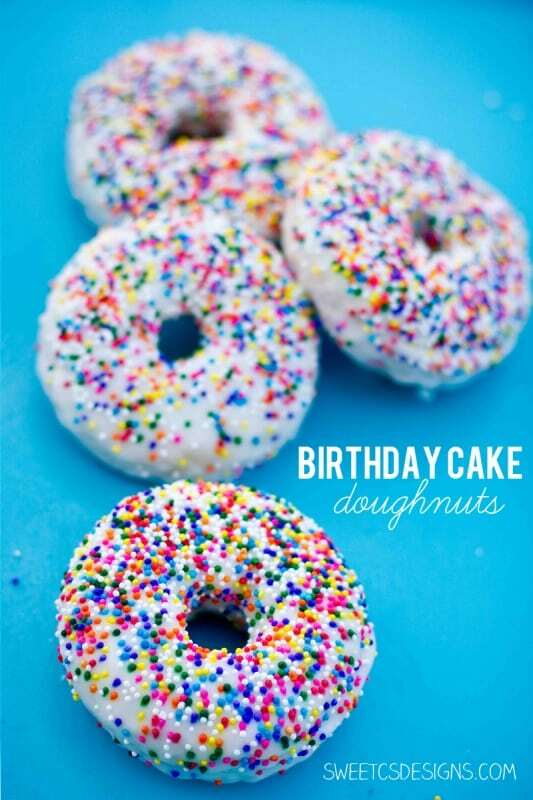 Instead of serving a boring old cake, why not serve individual Birthday Cake Doughnuts? They are delicious, easy to make and eat, and are so darn cute. You could even use this method with boxed cake mix, but I LOVE the recipe (and the gluten free recipe) I am using below. It is sweet, but not too overpowering, and has a perfect light crumb for a doughnut. So grab your Wilton doughnut pan, and lets get cooking! 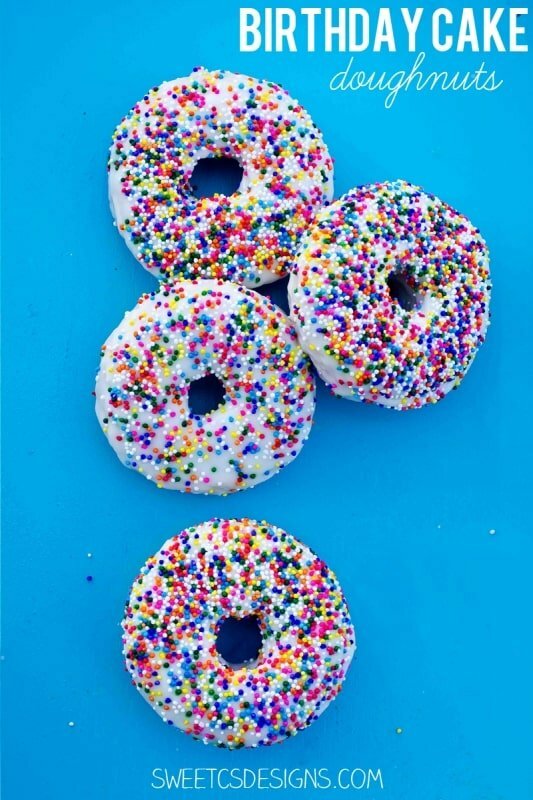 Skip the boring birthday cake and serve delicious vanilla birthday cake doughnuts instead! These are light, airy, sweet and super addictive! Generously coat a mini doughnut pan with butter and dust with flour (GF: be sure entire pan is coated in butter, including top and sides any overflow might touch. GF flour sticks more so you want to be sure it pops right out). Sift the cake flour, baking powder, and salt into a large mixing bowl (GF: also add in xantham gum). Beat in the butter one 1/2 teaspoonful at a time, using a stand mixer set on low speed, until the mixture resembles coarse meal. Beat in the sugar a tablespoon at a time, until the mixture looks like fine sand. Add vanilla and the milk, and beat on medium-high, just until blended. Do not overbeat or your doughnuts will be tough and chewy. Pour into doughnut cavities- only about 1/4-1/2 full so they don't over rise. (GF: this is extremely important! It is easier to remove if it doesn't spill over onto the sides of the pan when rising). Cool cakes in the pan on a wire rack until cool to the touch and doughnuts pop out when teased with a fork or knife. 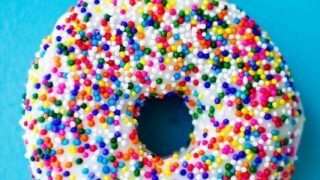 I like to serve them loaded up with sprinkles, because sprinkles make everything better! If they aren’t your thing, you could drizzle the doughnuts with chocolate icing stripes, use jimmies, nuts, candy or fondant flowers. Or maybe a decorate-your-own buffet! These are so easy and versatile, they are sure to be crowd pleasers. And for an incredibly easy way to frost these (with a divine, not-too-sweet icing), check out this homemade pourable icing, as pictured on these doughnuts. 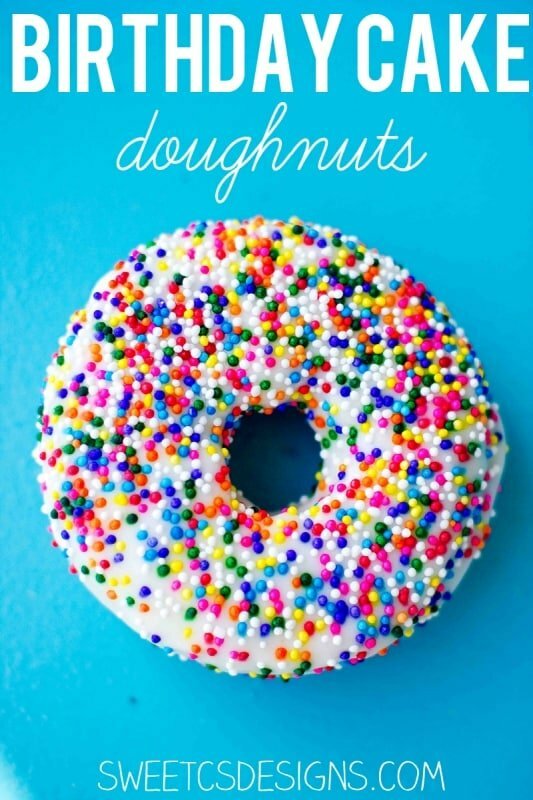 Or you can use store bought icing to pour over the doughnuts using this technique. What celebration would you make these for? Getting the laundry done is enough of an excuse for me. Speaking of… I guess that means I need to start the next load! Previous Post: « My Colorful Bedroom Remodel & A New Rug! Thank you for explaining more information. Nice cake, really nice cake with beautiful design. thanks. Really delicious. This recipe looks very nice. I want to make. It’s delicious. I want to get it. but how? Is it possible for me to make it? really it ‘s looking extra ordinary……………………………………………!!!!!!!!!!!!!!!!!!!!!!!!!!!!!!!!!!!!!!! These look so fun and delicious! 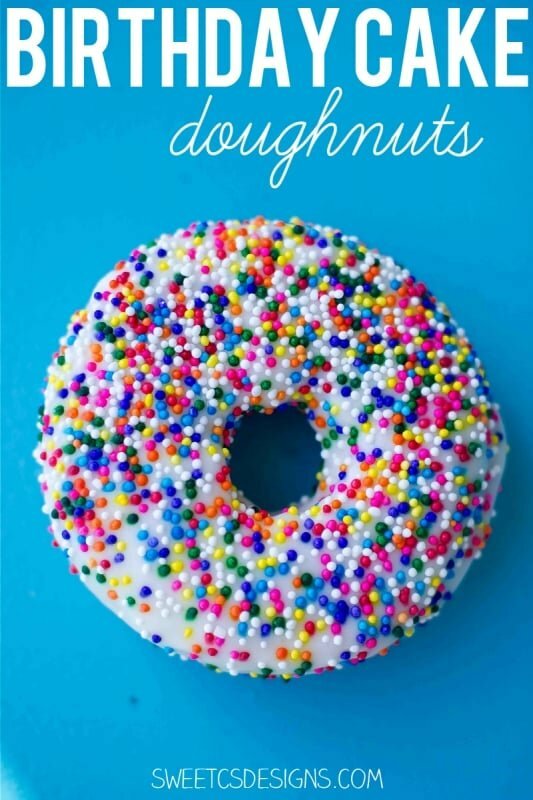 I’d be thrilled to have a Birthday Donut, instead of cake… Great recipe!